It’s a cozy Sunday afternoon and I’m sitting here watching the cold rain fall, thinking of all the times batch cooking has saved our family dinner time. Today, Danny is laid up with a nasty cold, and I’m juggling the busy household on my own, attempting to get ahead just a little bit for the upcoming week. I’ve brought Danny a mug of hot ginger tea with honey, and am the afternoon has filled up with washing school uniforms, baking cookies for lunches, wrapping up homework, and making a M-F menu plan. Still, the boys want me to play a game of Sorry with them, the baby’s getting into everything, and oh!wouldyoulookatthetime? the Twitter chat I’m co-hosting is starting in 30 minutes. I’m flying, and although I’m unsure if I’ll get half the things done I need to, I’m comforted with the fact that at least dinner is taken care of. Once again, batch cooking comes to the rescue. We’re going to have a hot, balanced home cooked dinner, thanks to a hearty chicken & red lentil coconut curry I’m reheating. All that is required is for me to steam some broccoli and dinner is served. Maybe we’ll even taste-test the cookies for dessert. No matter how busy the day gets, it’s really important to have us sit down as a family together for dinner; batch cooking is my time-saving tip to make that happen. Today our Eat Well, Spend Less team of bloggers are talking about time-saving tricks in the kitchen – and highlighting Jessica Fisher’s new cookbook: Not Your Mother’s Make-Ahead and Freeze Cookbook, too! Read on for more batch cooking tips and a chance to win a copy of Jess’s book. The apple pie in the photo at the top of the post? That was the reward of a little batch cooking. 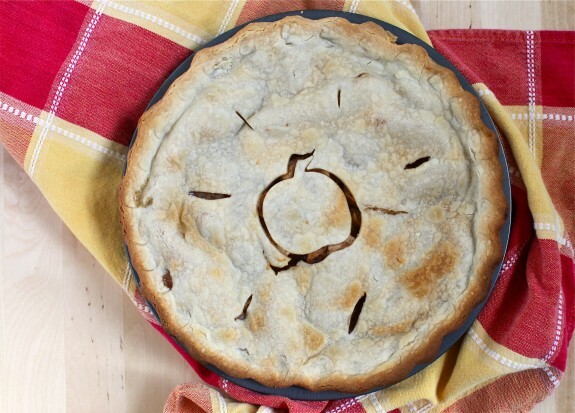 After an outing to the apple orchard, it’s easy to throw together a pie when there’s a a couple of pre-made pie crusts in the freezer. Contrary to popular belief, batch cooking doesn’t mean merely simmering a vat of spaghetti sauce or a quadrupling a recipe of chocolate-chip cookies, but expands to much, much more. Jessica’s book highlights meats and seafood, meatless mains, soups, and breads, and even desserts. Getting back to the apple pie, she makes up four of Nanna’s Apple Pies at a time and freezes a couple raw for a comforting impromptu dessert at a later date. So smart. Buy yourself some time on busy nights. Make good use of your produce box. Feed your baby homemade purees. Take a vacation — from cooking. Batch cooking also helps you spread some love. Case in point. On Saturday I attended a baby shower for a friend who is going to welcome a sweet baby girl any day now. While we heaped presents on this first-time mother, we also gave the shower a delicious spin by each contributing a frozen, home cooked meal for her freezer. I’ve long been an advocate of preparing heat & serve meals for others, dishes that are nourishing, travel well and freeze well. I’ve got a list of suitable recipes that fit the bill, but I can’t wait to change up my repertoire with new inspiration from Not Your Mother’s Make-Ahead and Freeze Cookbook. If you’re looking for suggestions for recipes that are suitable for freezing, adapt well to big batches, and provide a fresh take on family favorites, start with these 7 Favorite Do-Ahead Dinners for Winter. As is usually the case with young children, my boys palates haven’t changed that much and they stay in the regular rotation for dinner meals. 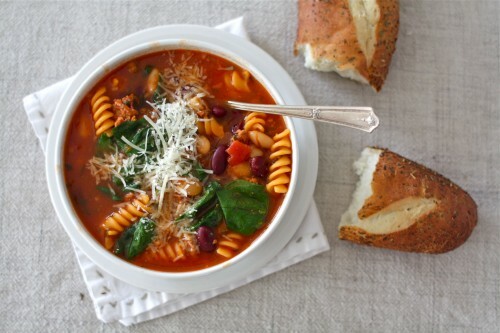 Here are several more recipe that adapt well to freezing and are perfect for this time of year. Jessica’s thorough and well-written cookbook boasts 200 solid recipes, as well as a host of tips on subjects like creating a freezer cooking plan, buying a deep freeze, and Christmas cookie production. This cookbook is perfect for any busy household trying to eat a real food diet without spending hours in the kitchen each day. 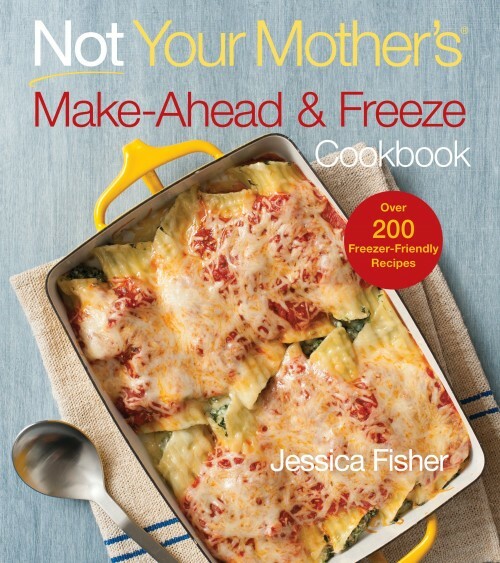 Thanks to the publishers at Harvard Common Press, I have a copy of Jessica’s Not Your Mother’s Make-Ahead and Freeze Cookbook (NYM Series) to giveaway! To enter: Leave a comment on this post and tell me something delicious you’ve made ahead and frozen. Giveaway ends on Tuesday, October 16, at 11:59PM. Good luck to all! I just put some chili and some chicken tortilla soup in the freezer. I can take those for lunch. I’m not rushed in the morning making lunch and I don’t have to spend money in the cafeteria. I would love to have this cookbook. meat loaf, chicken dishes, lasgagna dishes. I am in a rut and could really use a good source of some new recipes and this would def fit the bill! I love making my homemade spaghetti sauce and baked goods to freeze and just this month I tried chicken noodle soup. My husband loves soup and so I’m trying to learn to like them more too. I love making a big batch of succotash when the organic corn and lima beans are in season in our area. We just had the last batch the other night, so I definitely need to make some more next summer. I made her several trays of ziti (made with farfalle & homemade sauce), bags of 3-bean chili and beef stew, honey dijon and lemon pepper chicken. By far the recipe that has gotten the best review is a garlic, cheddar & broccoli twice baked potato. They freeze so well! We often freeze soups, slice and bake cookie dough, and prebaked pizza crusts. A friend also suggested freezing pizza toppings measured out to make homemade pizzas easier. Vegetable soup is a staple for my freezer! One of my favorites is white chicken chili. I am a huuuge fan of make ahead and freeze since I am often at the university until way past dinner time. It’s hard to pick a favorite, but I love freezing stuffed pepper filling so all I have to do is buy fresh peppers! chicken enchiladas taste better to me after being in the freezer awhile! I make breakfast burritos. My husband can take them out and eat as needed. i make, freeze, cook, and eat the daylights out of mac-n-cheese. I freeze spaghetti sauce; make it in huge batches, lasagna, soups, and chili. They all come in handy, especially for the days when I’m home from work after 6:30. Chili! I think it tastes even better after it has been frozen. Yummy! A while back, I used to meet once a month with some lady friends and we would each swap (5) 8×8 Pyrex dishes of frozen meals. I once made a southwestern chicken and spinach casserole. Would love to have a copy of this book to inspire me to branch away from the casseroles. Your unbeatable muffins recipe. I made tons of them before my daughter was born and froze them. Before bed, I would take one out to thaw on a plate. I would eat it during those late night/early morning nursing sessions. I called it my Midnight Muffin. Those sustained me the first couple weeks! Lasagne and soups are my freezer meals, would love to win this book to get more recipes!!!! i’ve frozen breakfast burritos – so delish! and recently just made my Busia’s meatballs and they are waiting for some cooler days for a great meal. Love to make ahead beef stew and freeze. I love to make chili and it’s great to freeze and re-heat. We often freeze it single serve containers and pack it for lunches. I always make extra and freeze my meals, but I don’t think they were all meant to be frozen. I’d love to learn how to REALLY do it! Baked potato casserole. I usually hate the “c” word, but this is worth the exception. Freezes beautifully in a baking dish for easy eating-day baking. Oh my would LOVE this cookbook! I always make pulled pork, double and freeze, because it’s so easy to pull out in the morning and slap on a bun or bread in the evening. I do a lot of soups that way, too. Because we have a small freezer, we have to lay things flat to use less space, soups in a bag work well for that! Being single and living w a roommate I live in constant fear of food going bad or being wasted … so even when I cook just a normal-sized meal I usually freeze at least half of it. Just last week I made brockley-cheese soup, super awesome for cool fall Cleveland nights. I would love to win this giveaway! Having two children under two can make getting dinner on the table a nightmare some nights. I’ve been meaning to expand my freezer food repetoirie, but I’ve afraid that I will end up with a garbage can full of freezer burned icky food. Right now, I’m limited to cookie dough, pie crust, and soup. As the summer progressed, I made roasted tomato soup (concentrated, so that I just add broth to the soup on the given night), butternut squash soup, and vegetable soup with the fresh produce we picked from our garden. would love to read this cookbook and get more ideas! I’ve make burritos and freeze them individually for nights when we are busy. That way we still get a decent meal when we get time. i want this cookbook!!!! I batch cook ALL. the. TIME. I freeze taco meat all the time … pull it out, add some tortillas, salsa, and cheese … dinner! Lasagna is one of my fav make aheads because its so comforting and hard for me to mess it up! We froze bags and bags of local fruit this summer–what a treat to eat a delicious fruit salad of berries and peaches in the dead of winter! I’ve made lots of sauces… but I think the best freeze ahead meal was a north-african marinated steak. Breakfast items like waffles and mini quiches freeze well. I have frozen oatmeal nut cookies baked from scratch.